If you have decided that it is time to get dental implants, you may be wondering what you can do in the interim while your mouth is being prepared for the implants. Some people simply resign themselves to a life without the proper teeth, figuring they can eat soft food and take other similar steps. However, you don't have to do this. 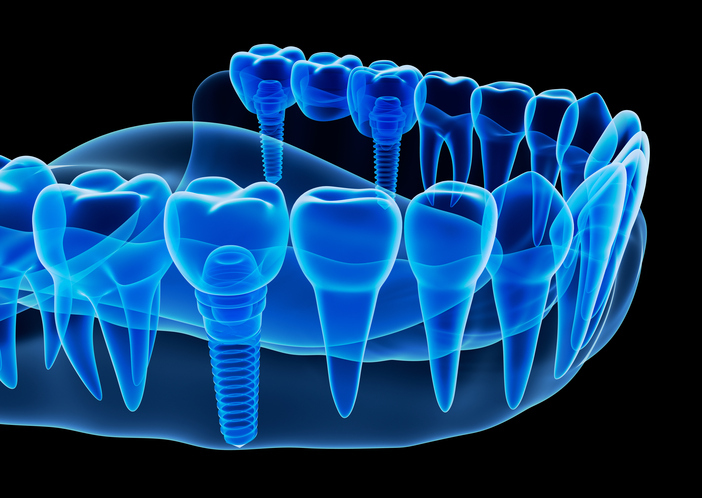 We can help you explore your options, and help you get ready for dental implants. In some cases, we suggest that our patients use a removable orthodontic retainer that has the missing teeth built into it. This retainer looks and functions like your normal teeth, but it comes out at night and for cleaning. While you would not want to go the rest of your life using such a device, it is a good temporary stopgap to rely on while your mouth is being prepared for your implants. Keep in mind that this device is not nearly as durable as your natural teeth are. It can break relatively easily, so it is probably a good idea to avoid chewing hard foods when using it. A device called an Essex bridge is also an option. Like the orthodontic retainers noted above, this is a device that has temporary teeth built into it. However, because it is a bridge and fits over two anchor teeth, it does not cover up the palate or tongue like a traditional set of dentures might. If you are electing for dental implants, we can help you maintain a relatively normal life while your mouth is being prepared. There are a number of other options available, so please feel free to give us a call or drop by for a visit. We can't wait to help you get your smile happy and healthy again!